The Morro Bay Estuary Poetry Contest Goes Wild! Our annual poetry contest opens on April 1, and we’re excited to announce a new twist on the contest’s theme. We will continue to accept haiku that focus on any and all aspects of the estuary—we still can’t resist the haiku’s history and its ability to preserve the moment and capture the beauty of nature. We’re also introducing a new contest category that asks writers to pen poems that focus on wildlife native to the estuary or the surrounding watershed. (See our complete contest rules, here.) We hope that this new contest category will give people a chance to learn about the animals that live in the many different habitats that make up the estuary and the watershed. The image above is just a section of the beautiful mural in the Estuary Program’s Nature Center that shows the different animals and plants that live in local habitats. The portion above shows some of the fauna native to the upland creeks, the salt marsh, and the mudflats. Visit the Nature Center to see more of the mural and learn the names of these organisms. We are excited to read about Southern sea otters, harbor seals, and California sea lions. Harbor seals dot the estuary’s waters. Photograph by Ruth Ann Angus. We want to hear about the birds that live here year-round and those that stop on their migratory route and stay awhile—the pelicans (both brown and white), the sanderlings, the willets, the snowy plovers, the coots, the long-billed curlews. Willits stand in the water and near the water’s edge. Photograph by Ruth Ann Angus. We want people to remember the steelhead, the bobcats, the ruddy ducks, the Morro blue butterflies, the stoneflies, and the water pennies that can sometimes be found in or around upland creeks. We would love to receive stanzas about the animals that inhabit the mud of the intertidal zones—the striped shore crabs, the inn keeper worms, the horn snails, the bent nose clam. 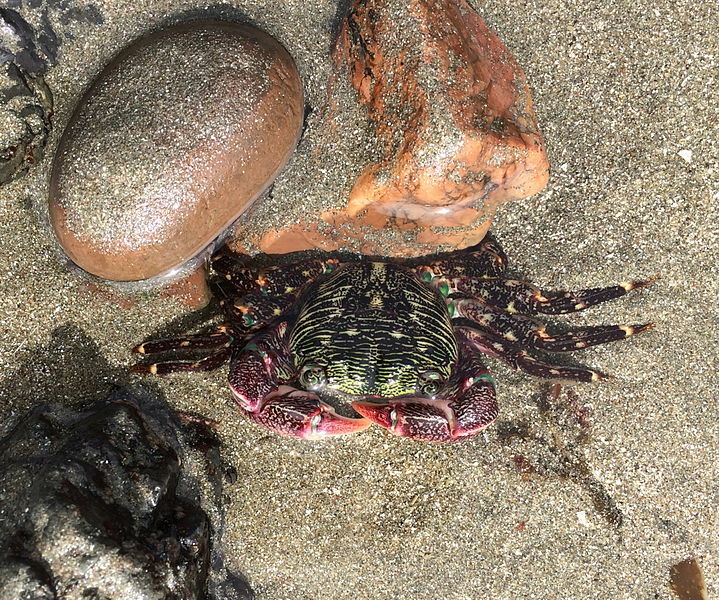 Photograph of a striped shore crab. By Peter D. Tillman. We hope that people won’t forget about the bat rays, the leopard sharks, the horn sharks, the aggregating anemones, the ochre sea stars, the sea hares, and pacific sanddabs. 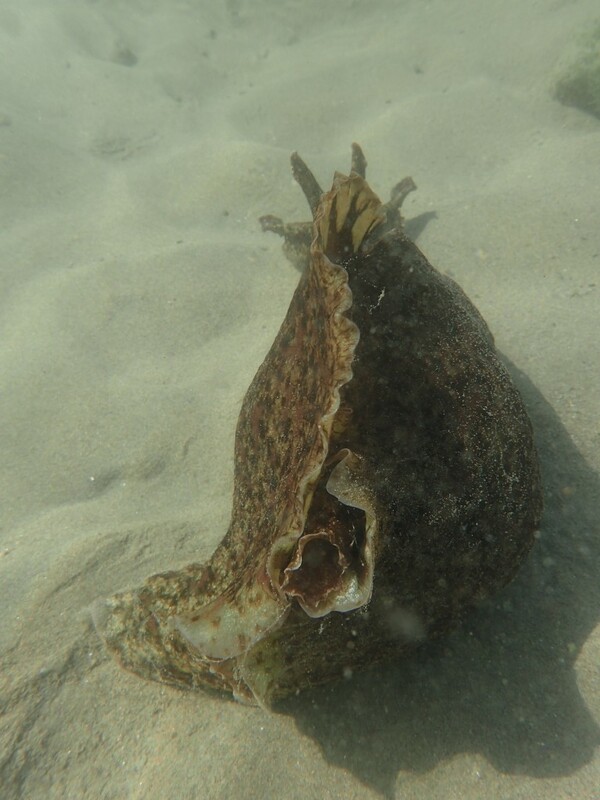 While monitoring eelgrass, our staff spotted this California sea hare under the water at Coleman beach. 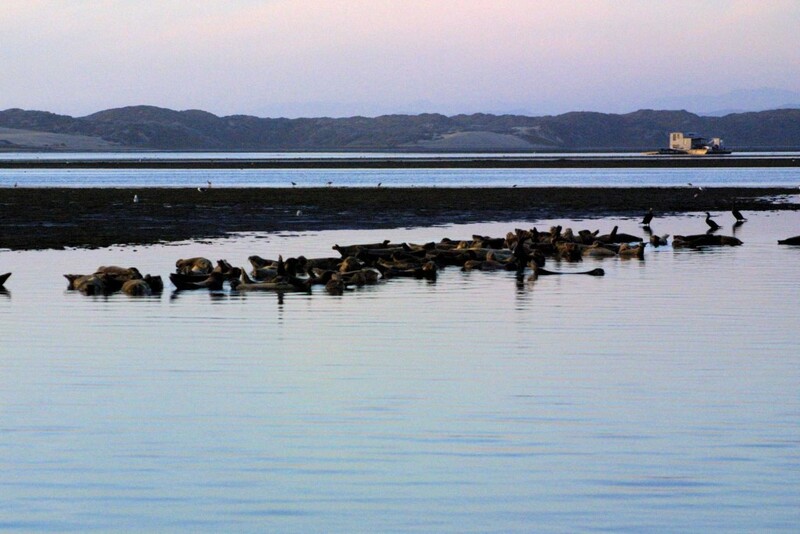 The Morro Bay estuary and the surrounding watershed are alive with possibilities! Visit the Morro Bay Estuary Program’s Nature Center. It’s free, and it’s open seven days a week. The Nature Center is full of resources to study in person, as well as some publications that you can take home. Stop by the Morro Coast Audubon Society office (right across from the Estuary Program office) to talk to a bird expert. Visit the Morro Bay Museum of Natural History. They have an extensive collection of specimens on display. 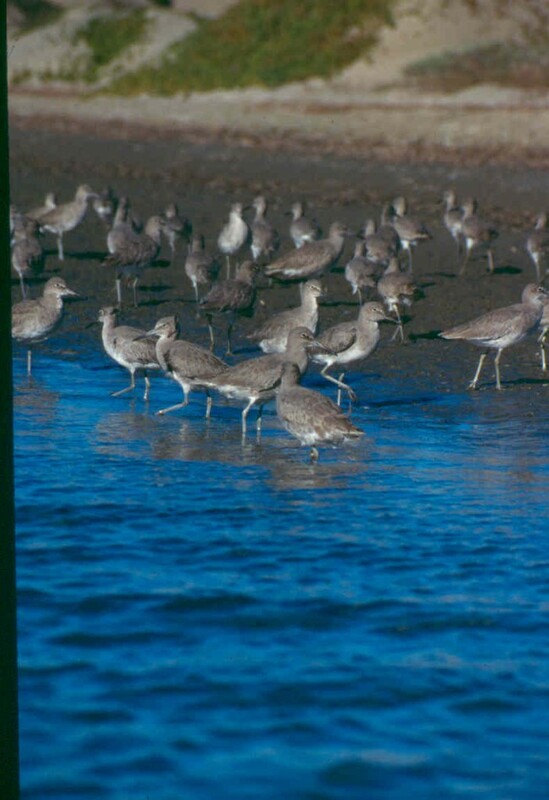 Check out this guide to Common Birds of the Estero Bay Area on our website. If you’re interested in some heavier reading and you want to focus on sensitive species in the local area, visit the Atlas of Sensitive Species of the Morro Bay Area on our website. Pages 56 through 200 give accounts of sensitive animal species. Check out iNaturalist to see what species have been spotted in the area, and research them to learn more.